GeMar Neloms is a Senior Technical Assistance Consultant with the American Institutes for Research. In her role with the College and Career Readiness and Success Center (CCRS Center) she provides technical assistance, training and content expertise to support the capacity building of State Educational Agencies and Regional Comprehensive Centers. Her primary roles are in product development and technical assistance across all focus areas for the CCRS Center. Prior to joining AIR, GeMar has consulted to and worked for national and local organizations in areas that include childhood obesity, education, youth, workforce and leadership development, health equity and human services. In addition, she has extensive experience in organizational capacity building, including strategic planning, professional development, strategic and collaborative partnerships and resource, board and program development. 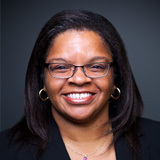 GeMar earned her Master of Public Administration from the Maxwell School of Citizenship and Public Affairs at Syracuse University and a Bachelor of Arts from Oberlin College.